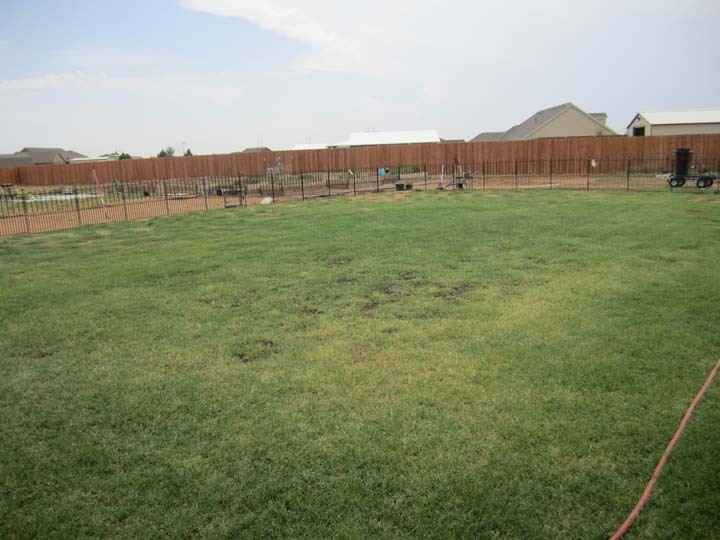 The property in Lubbock is a little over one acre with the majority of the acreage in the back. In the summer of 2012 it was loaded the stickers and such. The Beagles came in filthy. We wanted to keep the beagles closer to the house in a area where we are trying to grow grass. At Lowe's Home Improvement store we found a modular decorative fence made by Grand Empire. It was available in 37.75" H x 48" W sections. As their advertisement says, "Graceful classic design; simple to install; and crafted steel-coated for beauty. or "basement" as we like to call it. Growing grass within this fenced area will eliminate the beagles and us from tracking dirt into the house.